I get asked pretty often how I paint such small details. I always tell people that I use small paintbrushes and work on one square inch area at a time, but I don’t think that really quite explains it. Sometimes a picture is worth a thousand words so I thought I should take a before and after of my brushes. Now, these are actually in better condition than most since I’ve been working on small paintings lately. Usually I use these on some larger canvases and those bad boys destroy the bristles. Regardless, you get the idea. 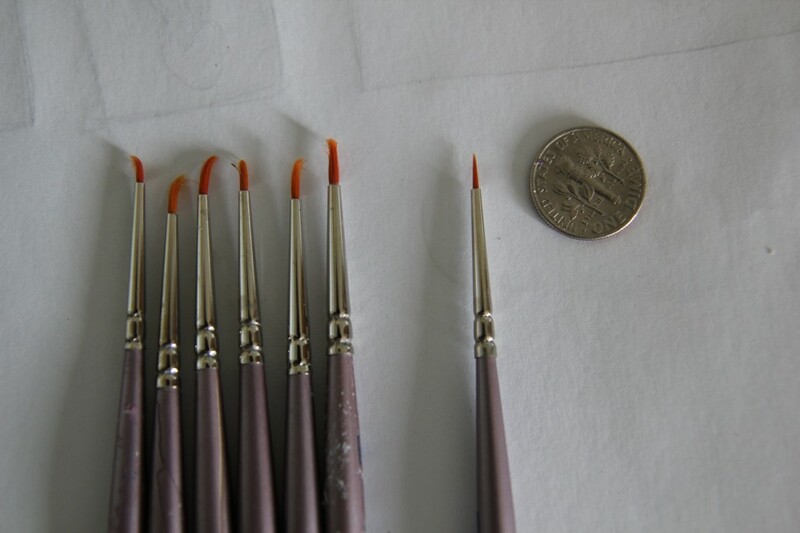 The new brush is on the right- crisp, pristine and miniscule compared to a dime. The group on the left are my “afters” with the bristles splayed out in different directions or completely curved which does not work very well for fine details. I go through roughly a brush a day, sometimes I can eek out two days, depending on the painting. Now just imagine taking that to a 30 inch tall painting: http://www.amyguidry.com/wild_west.html.